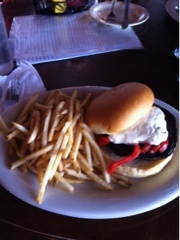 This one time, a vegetarian walked into a place called Buckeye Beer Engine. Said vegetarian does not eat burgers or drink beer. Vegetarian should have high tailed it down the street to The Root Cafe for some grub. In all seriousness, though, I'd been looking forward to checking out Buckeye Beer Engine. It's known for being vegetarian friendly (the menu clearly labels vegetarian items, for the most part - Caesar salad will never be vegetarian)﻿ and is in the land of great restaurants -Lakewood - so I figured it couldn't be too bad. Starving, we ordered the "vegetarian friendly" (ahem) fried pickles and mushrooms. I generally like deep fried anything (especially pickles), and I thought the pickles were a slam dunk but the mushrooms tasted funky. Like, these mushrooms are too old to deep fry funky. But we ate them because we were starving. My boyfriend ordered the cyclops? I think it came with an egg on it? He fancies himself an excellent burger chef, so he was a little underwhelmed. Although in BBE's defense, I'm not sure I've ever seen my boyfriend enjoy a burger at a restaurant. My stomach punished me later for this greasy meal. Fried anything plus a 6 mile run equals agony. I need to remember to wait to eat fried goodness until after running, apparently. And I need to remember that I'm glad that I went to this restaurant once, but I probably don't need to go back unless I start drinking beer or burgers. You'll see me riding down the street on my unicorn before that happens.